The manufacturing sector bore all the burden of growth in April, accelerating by 3.8% MoM as external demand is showing signs of stabilisation after the pronounced moderation we saw in 1Q18. 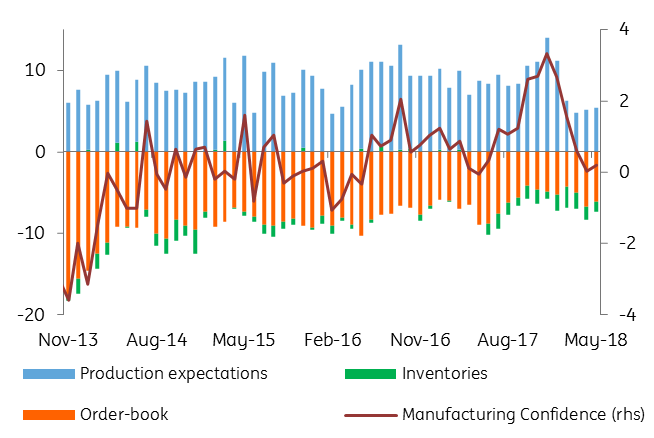 The latest Economic Sentiment Indicator (ESI) also indicated a slight return of optimism in the manufacturing sector. Mining and utilities on the other hand contracted 0.6% and 6.2% MoM, respectively. With industrial capacity utilization still below pre-crisis levels, there is enough slack to cover an eventual higher demand from existing production facilities. The data is broadly in line with our call for a slower economic growth this year. We see 2018 GDP growth at 3.5%, well below the government's forecast of 5.5%. This should narrow the output gap and cool down inflation, but it will also put pressure on the public finances.